Spray inside of a slow cooker with cooking spray. In a large bowl, combine drumsticks and half of the taco seasoning mix. In another bowl, combine the rest of the taco mix, black beans, corn and salsa. Place the chicken legs on the bottom of the slow cooker and top with the black bean mixture. Cover and cook 5-6 hours on high or 7-8 hours on low. Serve with shredded cheese. 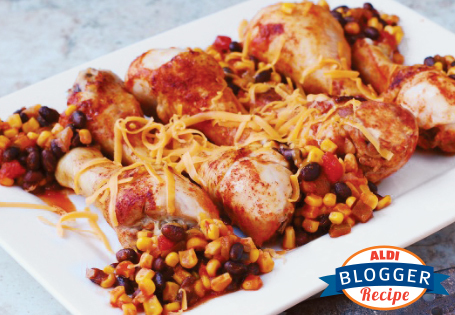 TIP: Dish can be prepared in a 350° oven, but put bean mixture on the bottom, chicken pieces on top. Bake, covered, for 1 hour to 1 hour and 15 minutes. Remove cover, top with cheese and bake for an additional 15 minutes.